A simulated battle field game for two or more players with realist gravitation forces from the earth, moon and sun. Available for iOS and OS X. Best of all beat your dad! 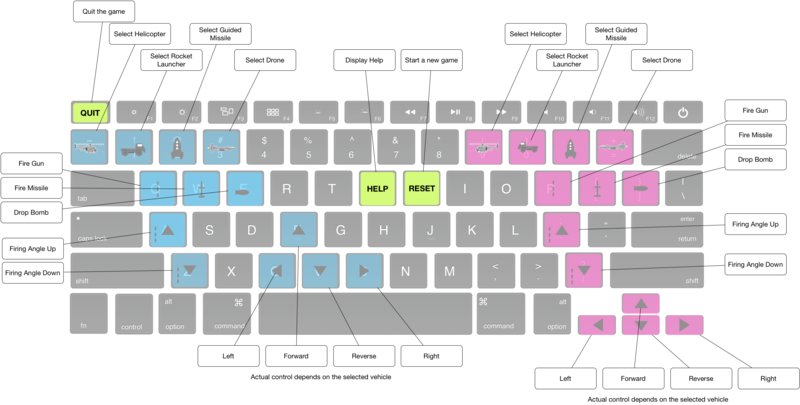 No need to buy an expensive game controller, plug a second keyboard into your Mac for more space or to allow more than two players. Helicopter lift comes from it’s rotors and the amount of lift depends largely on the density of the air. This is one of the reasons why helicopters struggle to reach climbers on Mt Everest to rescue them, the air that high up is too thin to provide sufficient lift. 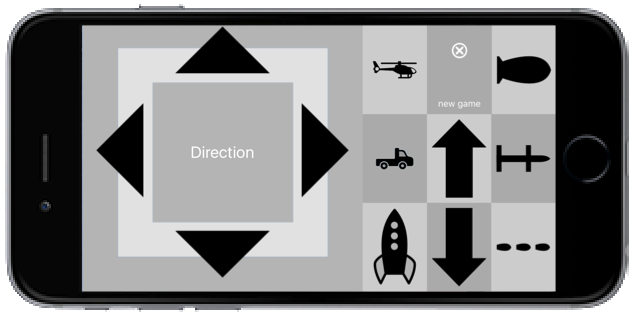 In this game we simulate the helicopters lift taking into account the altitude it is flying at. The higher you get the worse the lift becomes, try using the sun and moon to get a bit higher. Missiles are launched by applying an impulse after which the effects of gravity and wind resistance take over. In order to simulate the effect the missiles tail fins have on stabilising it we monitor the direction of travel and each simulation cycle adjust the direction the missile is pointing. Bullets are launched in a manner similar to missiles and we maintain directional stability by ensuring the projectile is pointing in the same direction as it is travelling. However because bullets have no tail fins when their speed drops below a certain level there are insufficient aerodynamic forces to maintain this stability and the bullet starts to tumble through the air. To simulate the effect of dropping a bomb from an aeroplane we use an aerodynamic lift calculated from the flow of air over the bombs tail fins to apply a rotation torque to the bomb. You will notice the bomb takes a few seconds to stabilise as it falls through the atmosphere. We simulate the lift generated by an aircraft wing by calculating a lift force based on the speed the aircraft is flying at. Similar to the helicopter this lift force depends on the density of the air and is therefor reduced at higher altitudes. Elevator control is also based on a lift force generated from the elevator surface, which changes the angle of attach of the main wing thus changing the angle of the lift force. Try cutting the power to the aircraft and watch how it glides down. Rockets are propelled and controlled by the main engine and by lateral thrusters. The main engine when engaged generates a constant force which results in a realistic acceleration of the vehicle, much like you see in a real life rock launch, such as the space shuttle.